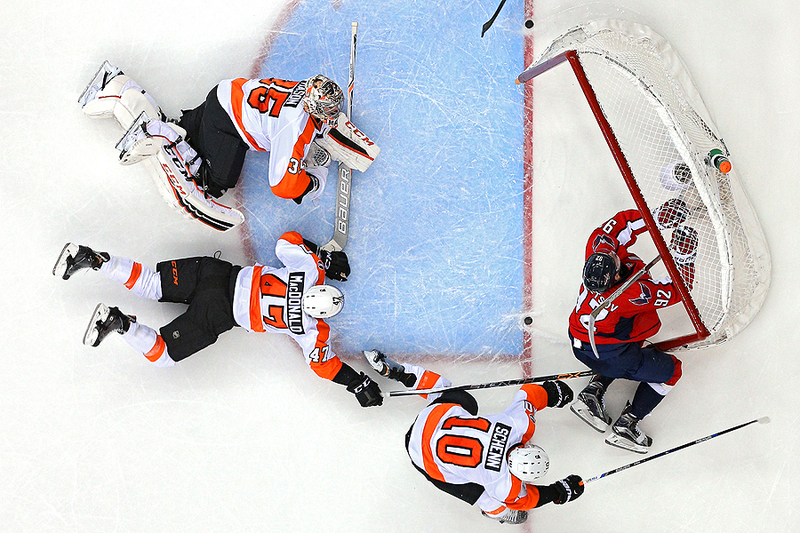 "Evgeny Kuznetsov #92 of the Washington Capitals is checked into the goal by Brayden Schenn #10 of the Philadelphia Flyers during the third period in Game One of the Eastern Conference Quarterfinals during the 2016 NHL Stanley Cup Playoffs at Verizon Center on April 14, 2016 in Washington, DC." It's playoff hockey time - and the excitement is just beginning. There is something that changes from regular to the post season where the fire is lit underneath the players. From the first puck drop until the Stanley Cup, the level of play is simply different. Each goal matters. Each check is bigger than the last. Each game is one step closer to being named the greatest team. We at Getty Images are always trying to capture the big moments from different angles. For game one of the Eastern Conference Quarterfinals, I thought I'd go back to the classic overhead remote. While I wanted something different, other photographers placed their remotes on the opposite goal, so I stuck to my regular routine. At the end of the night, nothing telling happened - no major saves or goals. Yet a check that sent the goal flying off of its moorings ended up communicating that intensity of the playoffs.